Enjoy uninterrupted quiet in our light-filled mountain top cabin. 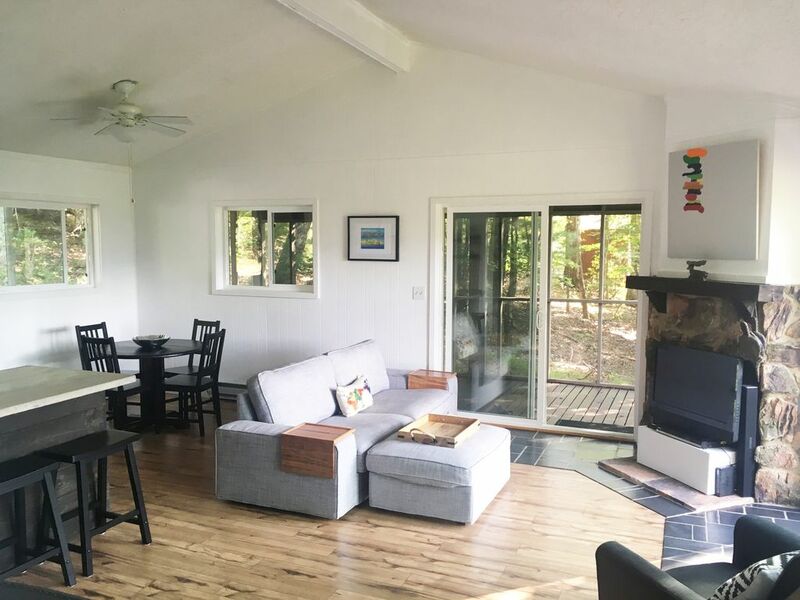 Just minutes from Bryce Four Season Resort, Lake Laura, Hiking, Wineries and Breweries Or just relax at the cabin in a stunning natural setting with views of the George Washington National Forest. This is our vacation home, and is fully equipped as such. Don’t worry about bringing a thing for cooking, we offer a fully stocked kitchen. We also have a gas grill, and a table and chairs on the deck so you won’t ever miss a sunset. If you are looking for some indoor entertainment, we have a number of DVDs, books and games for you to enjoy. Fresh linens and bath towels are provided and if you forgot your hairdryer, we have one of those too. The space is cleaned by a cleaning service after each stay. Please respect our home; treat it as your own, and leave it as you found it – clean, organized and free of damage. This space is not appropriate for children under 12, and parties are never allowed. Situated on top of a ridge, our home remains comfortable during the summer with cool breezes passing through home. There are ceiling fans in each of the bedrooms and one in the living room. Please note our home does not have air conditioning. We do not provide internet access or Cable TV. Please note our home does not have cable or satellite service. We provide a library of DVD's for your enjoyment. If you would like a broader selection of new release DVD's, the Sheetz gas station in Mount Jackson has a Redbox for DVD rental. We provide a number of card and board games for your entertainment. Very nice mountain retreat. Cozy bedrooms and nice open living area with beautiful views of the mountains. Worth the 15 mile drive from town. Despite the days of rain, we very much enjoyed our stay. A place to which we plan to return. First, in response to the previous poster, who must have stayed right before us, we saw NO evidence of the insect activity mentioned. The place was incredibly clean, so the comments are puzzling. This is, after all, a cabin in the woods, and yes you do see some insect activity, but hardly an infestation. We also wonder whether they contacted the owner about it, because we found John to be very responsive. In our experience, it's always better to contact the owner directly about an issue than to call them out in a public review. This was by far one of the nicer and cleaner cabins we've rented (two couples) and we definitely will plan to stay again. The views from the deck were beautiful and peaceful. We loved watching the fog in the valley in the mornings. The cabin was well-equipped and comfortable. Thank you, John and Parker, for making your home available to us. Unlike the realty companies in the past that I've booked with who inspect the properties before I arrived, its clear no one did this. The place had a serious termite or ant problem with half the stove covered in shavings from their activity. In a realty rental, I could have called them and switched out to another rental unit..but no such luck with VRBO, its caveat emptor. Never again. We're sorry to hear you did not enjoy your stay. We wish you had reached out to us directly with any issues and we would have worked with you to resolve them. In response to your comment - we do not have a termite or ant issue. The debris on the stove is related to a water leak from the skylight above the stove. Around the time of your stay we had some major rains that contributed to a crack in the ceiling that allowed particles from the roof to fall on the stove. As soon as we learned of the issue, we scheduled a roofing company to replace the skylight and repair the roof. We take great care of our home and hope that everyone's stay is a pleasant one. If a guest does not report an issue to us, we can only assume they are enjoying their stay and that there are no issues. We apologize again that you were not satisfied with your stay. My boyfriend and I stayed here for a long weekend trip and loved it. It is a beautiful, rustic but modern place, with a gorgeous view of the mountain ridges. We also loved the fully equipped kitchen which allowed us to cook several meals together. The cabin is very comfortable as well, and when we were not outdoors, we entertained ourselves with watching the many dvds (there is no wifi or cable as the posting had described). There are some nice hiking nearby, and we also tried paddleboarding at Lake Laura which was fun! John and Parker were also very timely in responding to our questions. The only downside, which we basically accepted as a part of being in the mountains like this, is that it is a drive (20-30min) away from grocery stores and or restaurants but we were well aware of that. Overall a great stay! There are many vineyards close by. If you google vineyards in the area, you will find a lot to choose from. Cave Ridge is one of the oldest and periodically has out door music on the weekends. Muse is a newer vineyard, but if you are really into wine, this is one of the best. There are not a lot of restaurants in the immediate area, but the Copper Kettle Bar and Restaurant at Bryce Resort offers a full menu and is a great place to eat. If its a nice day, ask for one of the tables outside at the base of the ski slopes and watch the mountain bikers barreling down the slopes and over jumps. Bryce Resort's 18 hole championship course is one of the Shenandoah Valley's premier destinations for golf.